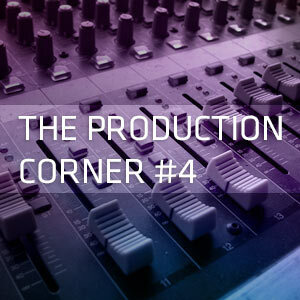 Welcome back to the Production Corner ! It’s been a while and I’m sorry for that, I was snowed under work and I didn’t want to botch up an episode just for the sake of posting one. So without further ado, let’s get back into business. Today we’re going to look into the groove. It’s has been requested a few weeks ago, and I’ve finally found of way of approaching that topic. The first meaning of groove refers to a feeling : it’s something you can definitely feel when you’re listening to a piece of music. As a consequence, it applies to any genre of music, be it Jazz or Hip-Hop, Funk and Soul, etc. It goes well beyond the scope of electronic music. It’s also depending on the rhythm, thus you can oppose straight to groovy. Straight could be seen as mechanical, especially in electronic music when the drums are programmed on a rigid grid. 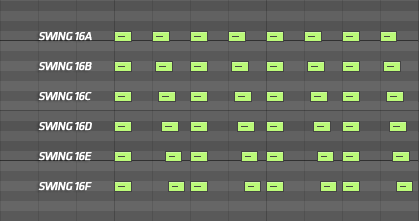 In digital audio workstations, you can see this grid on the screen. It’s a representation of the tempo over time. This grid is linked to the tempo, with divisions every note, ½ note, ¼ note, and so on so forth, the division being an even number all the time for the 4/4 time signature – which has to be the most popular time signature in electronic music. You can see now that the groove is depending on the time between elements, and how the interact together. Of course, some other factors, such as the color and flavor of the sound will influence the groove, but it’s important to remember that groove is primarily based on the timing of the different elements. That’s why you can describe a groove as being loose, or tight. I come to say that groove is a technique in electronic music because most of the sounds producers use are not live recordings of live performances – we’ve seen that before, but still, they’re able to mimic that effect “in the box”. To illustrate that, I need you to picture two examples in your head : a drummer, and a bass player. I picked these two because drums are a key element in electronic music, and so is the bass. Back in the days, the players would do their part and add a certain touch to it, be it voluntary or not. That what we’ll call the human factor, and the machine cannot reproduce it on its own. That’s what make the sound alive : the playing. That performance would be recorded on tape, and mixed on large mixing consoles with so many buttons and knobs on it, you could mistake it for a space shuttle cockpit overhead panel. Now today, as we’ve already seen it, most of the work is done into a computer, with little hardware, and little recording going on. Consequently, most of the human factor is gone. So, how do you recover that, and make banging tech house tracks with the groove of a 70’s funk hit ? You could, using a midi controller with very accurate velocity response a very little latency, play the part into the computer. There’re MIDI drum kits out there, and they do a good job. But you still have to be a good player to get a good beat. And you can’t get a hold of them if you’re a broke bedroom producer with a sole laptop. So how do you get around that, if you’re just average with the drums, or you’re just familiar with programming beats on screen ? And what about that bass part ? Call quantization and shuffle in. Quantization has to be the most beloved feature of any techno producer out there. Simply put, it allows you to turn a straight and mechanical part into a more dynamic and exciting bit of sound, by slightly altering the timing between the notes. Shuffle does the same thing, but with a different method : while quantization is based on pre-established time signature templates, shuffle works its magic by dialing in a bit of randomness in the space between each note or hit. And you can get an even more drastic effect by combining the two of them. Here’s a screenshot of a the same group of short notes with different quantizations applied ; you can see how strong the effect can be if you want it to. Swing 16A is straight. However, some producers never quantize because they like the feel of the parts as such. Nevertheless, if they were given a bland part, it’s very likely that they will treat it someway or another so that it matches the groove. Presently, it’s even possible to extract the groove of a recording and to apply it to a different one. Getting a good bass part is quite the challenge if you’re not a bass player. Note length and velocity are extremely important, especially if you’re looking for snappiness. Quantizing the bass part against the drums can help you a lot, making the sounds more glued together, more coherent, and more importantly more compelling and authentic. I heard that quote once “Sidechain compression is to electronic music, what tomato sauce is to Italian cuisine”. And it’s true ; sidechain is everywhere in electronic music. For clarity purposes, so that two sounds don’t clash each other, or fight for frequencies, but also for the well known pumping effect. If you’re not familiar with sidechain compression, think of a volume knob that is linked to input that commands its action. When the input sound reaches a certain point (the threshold), the compressor will lower the output of the sound it is compressing, following a ratio that dictates how much the sound should be compressed. By lowering one sound, it’s making more space for the other one, thus making it louder. And since it’s a dynamic process, with extreme settings you can get the pumping effect that makes the track even more groovy. And what about the vibe ? The vibe and the groove can be pretty intricate and complementary, but the vibe cannot really be defined and accomplished in technical terms. The vibe is much more organic in its essence, and it has to be considered as a whole – it resembles much more how you can describe the track, with adjectives such as “warm”, “engaging”, etc. It your judgement of the song, as a performance, of its mood, of its atmosphere. The color of the sound plays a big part here, hence why plugins emulating vintage gear are very popular. In the end, these techniques won’t get you the inspiration, nor will they buy you a great track, but they’re essential allies to making a groovy production with today’s means and standards of production, and they’re part of the daily routine of many producers out there. See you next time, until then, feel free to hit me up on Twitter if you’ve questions and suggestions.